Dr Jurgen Schwanzlieber, who came up with the initiative says the procedure would ‘significantly reduce’ the number of cases of teenage girls and rugby players being treated for dermatological illnesses, caused by the toxins of ‘fake tan’ coming into contact with the skin. In some cases, these toxins have been found to have contained cancerous properties. “We realise the idea of performing cosmetic surgery on a newborn child will be seen as controversial at first, but, communicated properly, we believe the proposal will be welcomed by parents as they realise that the long-term benefits to their child’s health will be worth it”, Dr Schwanzlieber said. 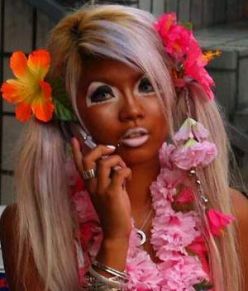 The negative publicity associated with tanning products reached a nadir two weeks ago in London’s Palladium theatre.Two teenage girls wearing fake tan and sitting in the front row at a performance of Charlie and the Chocolate Factory were forcefully bundled onto the stage midway through the show after an usher mistakenly identified them as Oompa Loompas. The parents of the girls involved have launched legal proceedings against both the venue and the show’s producers, claiming the girls had suffered ‘mental anguish’. The Minister for Health, Dr James Reilly, refused to be drawn on the issue when questioned in the Dail yesterday, saying only that he would not comment on any reports that had yet to be made public.